The thing is that I don’t normally post on Thursdays, but sometimes life tells you to make Thai Yellow Curry Paste, and as a result, you need to share a recipe that uses it on the very next day. NEED to. Because I know every single one of you sweet readers has that curry paste made, packed into jars, and ready to be made into this luscious Thai Yellow Chicken Curry. Right? COME ONNNNNN you guys. You should know – or should you know? too late – that just this morning I went into the fridge to pack up the leftovers of this Thai Yellow Chicken Curry and I found myself eating them straight out of the pan instead. This is one of a million reasons why writing a food blog works for me – I don’t even need to make this stuff up. I am usually not a savory morning person, okay? I want my toast and peanut butter and honey and/or my donuts, and I want them bad. But this curry is honestly so good and so perfectly savory with just a teensy bit of sweet that this morning, before 8am, I found myself scraping out the extra curry-coated rice from the bottom of the pan and spooning it all straight into Ze Mouth. And as I enjoyed a few bites of that cold, creamy Thai Yellow Curry as my .5 breakfast, I had this thought: why am I not eating yellow curry for breakfast every single day? It’s so comforting, spicy-sweet-savory, soul-hugging, and it just generally puts me in a good mood about life. Curry therapy. Curry morning therapy. This is a thing starting now. Okay, here’s what we have going on in this beauty. Obviously, to start, the yellow curry paste from yesterdays’ post. 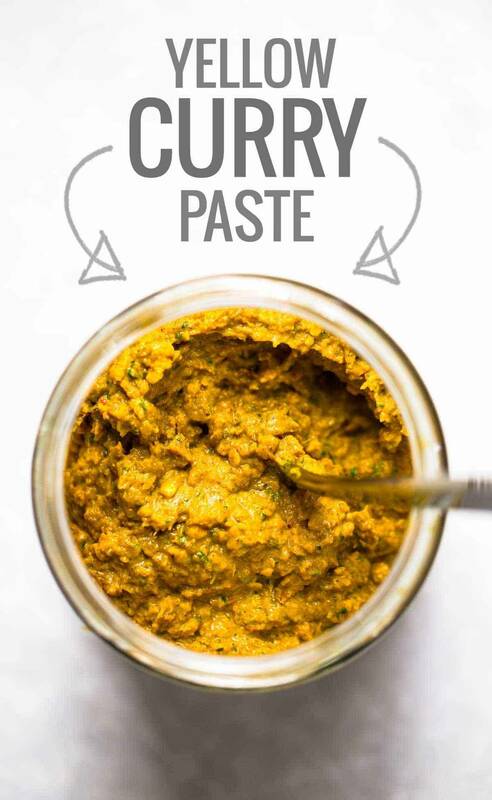 If you did not make the yellow curry paste from yesterday’s post, fear not. You can either make it real quick (45 minutes) so you’re ready for this recipe x4 because you’ll have enough left over to make it again and again, or you can buy a little jar of yellow curry paste. Except the only problem is that if you BUY yellow curry paste, a) I don’t know where you’re going to buy it from because I can never find it at my grocery stores – they have red, they have green, but they never have yellow – because they hate me and they want to starve my curry addiction? I don’t know. You tell me. and b) you will probably need to change the amount used in the recipe because I make no guarantees that the store bought will match the spiciness and potent-ness of the homemade version. Guys, I know it takes a little time (45 minutes, yes, I hear you) but it’s SO TOTALLY WORTH IT. You will love yourself so much in a few weeks when you’re ready to have curry again and you remember – boom! I’m awesome and I already made curry paste and it’s in the freezer ready to become my delicious, comforting, Thai Yellow Chicken Curry dinner. If you make your own paste and have it on hand in advance, this Thai Yellow Chicken Curry recipe *almost* reaches the level of Five-Ingredient Easy, which, in and of itself, is worth the effort. This is the best food gift you could give yourself. Make it make it make it. You’ll love it. Please try it. BUT SERIOUSLY. DO IT NOW. This Thai Yellow Chicken Curry is comfort food meets takeout at home. Or are those the same thing? It’s so good – especially if you treat yoself with the coconut cream instead of the usual coconut milk – and it is so simple to make, you won’t even believe it. Onion / chicken / yellow curry paste / potatoes / coconut milk / done. That’s it. And the flavor. Ohhhhh that sweet Thai yellow curry flavor!!!! <– it has come to this. Excuse me while I go back to the fridge for those leftovers I meeeeeean…. Thai Yellow Chicken Curry with Potatoes – the ultimate comfort food that is surprisingly easy to make! So perfectly savory with just a teensy bit of sweet. Add the coconut cream and 1/2 cup water to the pot – simmer for 20-30 minutes or until the chicken and potatoes are fully cooked, adding more water depending on the consistency you want for the sauce. *Note: the software we use for the nutrition labels does not have the correct information for coconut cream in the database, so this label includes coconut milk, not coconut cream. Coconut cream is thicker than coconut milk and it has more calories. Coconut milk would work fine in this recipe, if you just adjust the amount of water based on the consistency you want for the sauce. But if calories are less of a concern, coconut cream will make it REALLY delicious. Also, this nutrition label does not include rice. Red, yellow, green, massaman, I love ALL the curries. In fact, the recipe that led me to your blog was crockpot red curry lentils a few years ago. I’ve been reading ever since! Aw, yay! I love those curry lentils! Thanks Prash! Love that I’m not the only one!! Thanks Christine! Love hearing that! Hope you like it! Oh man I could eat curry for breakfast every day! I love it. There really is nothing else like it. Your curry paste (and this recipe) are on my list of things to make for dinner soon. Thanks for sharing! Yessss! enjoy that curry paste! Is it ok to substitute lemon grass in place on lemon grass paste in the curry paste recpie?. It has whey in it and I’m vegan. Thanks. This looks gorgeous! I love the way you make sauces and then show us all the ways we can use it. Such a brilliant idea! I so excited to make your curry recipe and make this! It sounds so good! I love these vibrant colors and confess that I have never made my own curry – looks like it’s time to start!!! Seriously! Hope you like it Mellissa! Oh gawsh – now my screen is covered in drool! Love, love, love this!! I’ve never tried eating curry for breakfast – I don’t think I’ve ever managed to have leftovers hang around that long! I also love your enthusiasm in trying to persuade us to make the curry paste…yellow is not easy to find in-store over here either! Pinned! Glad to have a fellow yellow curry lover on board with this! 🙂 Hope you get the chance to make the paste Justine! Oh, gosh ….. I just fell off my kitchen stool – wow! The thought of Yellow Curry for breakfast sounds amazing. Thanks Gisele! I hope you like it! This looks AWESOME!!! How do I not know what coconut cream is? I know cream of coconut, like what you use in pina coladas in the drink aisle… but am assuming this is different? Can it be found in the Asian section of the grocery store near the coconut milk and I’ve missed it all my life?! Thanks, Lindsay! Yes – they have it stocked with the coconut milk at my grocery store. It’s SO GOOD – it’s just like coconut milk but even more creamy. NOT the same as cream of coconut, though (I don’t think) because it’s not sweet at all – it’s just the coconut milk x 10 in thickness and lusciousness. 😉 Good luck Senika! Whoa. Savory things for breakfast? I thought only my guy did that! (He hates anything sweet in the mornings. Which means we only eat donuts or cinnamon rolls as dessert after dinner. He also hates chocolate and peanut butter, so… Take his opinions on breakfast food with a grain of salt. 😉 ) You’re doing an awesome job at selling this yellow curry Lindsay — I’m so tempted to get started on the 45-min process right now! Dooooo it! 🙂 Thanks for the comment Amy! I have to try this now, maybe even for breakfast (and I usually have to force myself to eat breakfast). I love the color, can’t wait to try it! Made it yesterday and LOVED it!! Thanks for the recipe. I love eating curries and now I can say I know how to make a great one! Yaaay! I used fresh red Thai chilis (that’s all I could find) and they were delicious but I used 10 and it was super hot! I love spicy food, and I definitely enjoyed it but took a few “tongue panting, must drink milk” moments. Might use 7 ish next time. There will absolutely be a next time! 🙂 Delicious! Thanks for the feedback, Karen! Glad you enjoyed it! Oh I LOVE that you used a homemade curry paste! Ever since living in India for a summer, I can’t get enough of curry. Red, yellow, green, brown, you name it and I’ll eat it. Thanks, Lindsay! Yay! We can all start a curry-for-breakfast movement. 🙂 Thanks, Elisa! Curry is an amazing spice that is totally under-utilized. I will definitely need to make this! Thanks for the recipe. These curry potatoes sound amazing! I would love to have these for lunch this week! Dang, this sounds good! I really have been making more curry recipes lately so this sounds perfect. Thanks, Raquel! We love hearing that! This is my husband’s favorite curry dish! Can’t wait to try it! Awesome, Emily! Hope you guys enjoy it! You’re right, to get yellow curry paste you have to make a special trip to an Asian grocery store. It’s an ordeal when you live in a rural area. Making curry from scratch can be time consuming but it is so worth it! After visiting this amazing famous Thai restaurant in London, I bought a bunch of Thai cookbooks spent a month making curry pastes. Needless to say, I was obsessed! No doubt, the fresh stuff is better! Can’t wait to try these recipes!